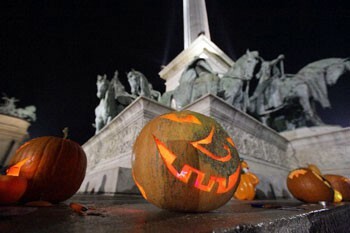 Although it is not a Hungarian holiday, celebrating Halloween is becoming more and more popular in Budapest and other parts of the country. 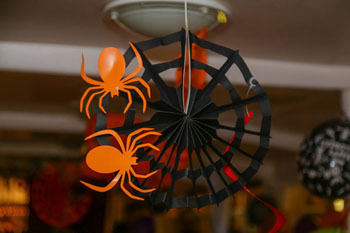 So if you happen to be here around the end of October-beginning of November and can’t live without all things Halloween, here are some tips on parties, festivals and other events. TIP: If you want to celebrate the event like Hungarians do see the background information on All Saints Day/Mindenszentek on 01. November down the page. Note: 01. 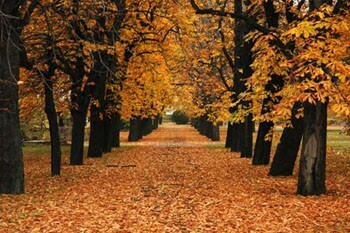 November is a public holiday in Hungary. Shops, markets will be closed. Public transport services operate according to holiday schedule. 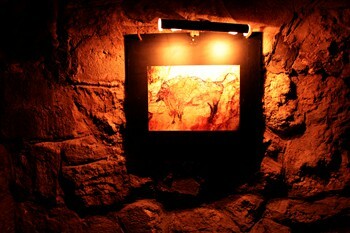 Venue: Underground Fear – Horror Labyrinth, Rákóczi út 30., district VII. “You will experience your worst fears in this scenic, action packed and adrenaline filled tour where you will meet with diffenerent kind of monsters along the way. Your experience is guaranteed by our realistic, unique, handmade theatricals and stage-set as well as our creatures of the darkness. See tour dates and booking here. For a bit of thrill visit the Labyrinth in Buda Castle Hill where Dracula, the legendary Vlad Tepes was kept in prison in the 15th century. The naturally formed caverns provided shelter for stone age man, then citizens of the castle district connected the caves in the middle ages forming a labyrinthine system. It functioned as a bunker in World War 2 then it was a top secret military object in the cold war era. Today it offers some exciting exhibitions that you can view at night by a light of a lantern if you aren’t scared of ghosts and other things that go bump in the night. Come and learn about the true story of Count Dracula, the world of scary vampie stories and celebrate the birthday of Béla Lugosi the world famous “Hungarian Dracula” of Hollywood. Visitors can also wander around and view the exhibitions in the mysterious halls of the castle’s Gothic wing. Watch a spooky performance in the Vampire Theatre by teh Terminal Workhouse team (registration to this program is required at the kozonsegkapcsolat@mmgm.hu email address). You can also join a torch walk fitting to the theme of the evening. Date & Time: 18.00 – 23.00, 26. Oct, 2018. Tickets are available in the ticket office of the Holnemvolt Castle, from 17.30. The Zoo will be closed during the event. 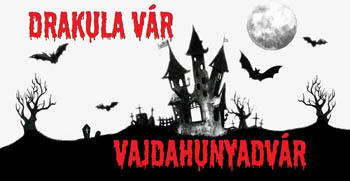 The awesome, new playground of the Zoo, Holnemvolt Vár awaits everyone with exciting Halloween programs and food on 26. October/Friday. A charity event organised for couple of years now. Get a pumpkin lantern and some canned soups, pasta or other non-perishable food and come together with others on Hősök tere. The food items go to a non-profit organizations, called Gyermekétkeztetési Alapítvány (Child Nutrition Foundation). See more on the event’s website. The event is is free to attend but if you wish to participate in Trick or Treating please register here! Take your kids for some Trick or Treat fun in Ráday utca, a popular restaurant street between Kálvin Square and Boráros Square. Hello Hal Fish Bar, Ráday utca 5. Rombusz Terasz, a garden with drink bars and street food, Ráday u. 12. Soul Cafe, Ráday u. 13. Manga Cowboy – burgers, Asian dishes, Ráday u. 31. 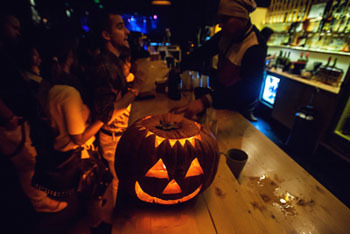 Bring a Jack-o-Lantern to the participating restaurants, cafes and you will be rewarded with a glass of mulled wine. Address: Hold utca 13., district V.
The bright orange vegetable and the symbol of the holiday will be in the focus on the last Saturday of October in the Downtown Market in Hold Street. pumpkin carving for al ages with the help of professionals as well as pumpkin-inspired food on the eateries on the gallery. Kolbice – grilled baby sausages in a cone-shape bread – with pumpkin seed. TIP: The Belvárosi Piac, as it’s called for a couple of years now, is one of the most atmospheric food markets and street food places in Budapest, so do drop by even if you can’t make it on 28.Oct. Really tasty local food, a bakery on the first-floor and quality produce, dairy and meat on the ground floor level. Party away on a special Halloween-themed ruin bar crawl on 31. October. 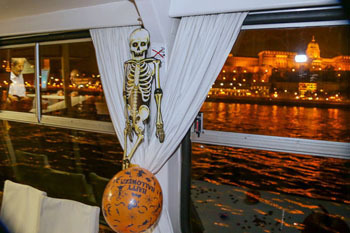 Have Halloween fun on a party on the Danube! The city’s night light reflecting off the dark waters of the river lands a mysterious ambience to the event. 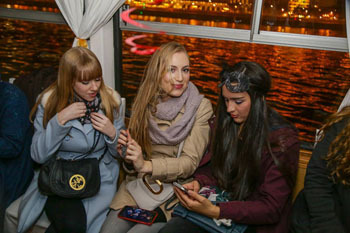 A two-hour sightseeing tour on the river. Roots• 1077 Budapest, Kiràly u. 77. Deep• 1062 Budapest, Aradi u. 22. Address: Ajtósi Dürer sor 19-21., district XIV. This spacious club and garden bar in the vicinity of the City Park offers countless ways to chill out. The large garden hosts cultural, family and lifestyle programs from spring till autumn. 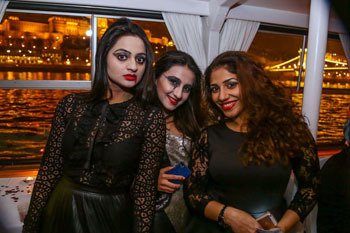 The place has a large concert hall equipped with state-of-the-art audio visual technology, a smaller concert hall and Room 041 for mid-size concerts and parties. The centrally located Ötkert Club nera the Basilica hosts a party on the last day of October with live DJ-s. If you come in your most scary costume you’ll get a free welcome drink. Time: 17.00 Oct 31. – 05.00 Nov 01.
terrific decor that guests can try: lie inside Dracula’s coffin for a photo. Liget Club is one of Budapest’s party hot spots. The theme of the party is the “The Forbidden City” known for its gross indecencies and joyous lusts. Halloween will take you back to this mysterious city, wear a costume because you don’t want to reveal your real identity at this forbidden place. Address: Akácfa utca 49-51., district VII. A popular Hungarian electropop band, the JETLAG will give a concert on All hallows Eve in the city’s famous ruin bar: Instant. Address: Ó utca 51., Budapest 1066, distr. VI. Address: Király utca 13. – Dob utca 16., district VII. 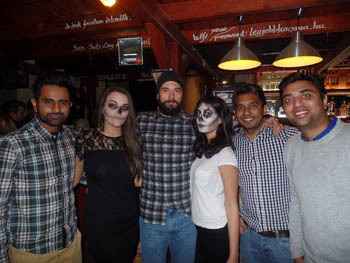 Most restaurants, bistros and cafes are preparing with Halloween inspired dishes. cakes and desserts with poppy seed and walnut. Date: at 19.00 28. Oct – 02.00 29 Oct 2017. One of Budapest’s best restaurant invites you to a hilarious Cocktail Party with a special decoration, Halloween cocktails and menu. On 1st November Hungarians commemorate all Christian Catholic saints that don’t have a designated holiday in the calendar. The truth is that the early Catholic church had chosen this date (in 835 AD) to be a holiday to oppress the All Hallows day or Samhain celebrated all over the non-Christian Celtic world. According to Celtic traditions, on Samhain the barrier between the world of the dead and the living gets thinner allow the two parts to communicate with each other. no pumpkin carving and kids going house by house chanting “Trick or Treat”. Hungarians go to the cemetery to honor and remember their departed family members, relatives and friends. Cemeteries in Budapest are spectacular this time of the year: beautiful wreaths and bunches of chrysanthemums adorn graves, the light of candles flowing gently in the night breeze can be seen from afar. Note: It is a public holiday so shops, markets, and most public institutions, restaurants will be closed.